I started this blog over five years ago.  Having always been a fan of retail and shopping and deals, I've tinkered with the idea of sharing shopping related experiences as special posts on the site. This is the first of what may become a series of retail adventures. It's no secret that outlet shopping is not what it once was. Today, more than half of a typical outlet is made up of merchandise manufactured for or purchased specifically for outlet sale, often of lesser quality than the full line merchandise. At stores like J. 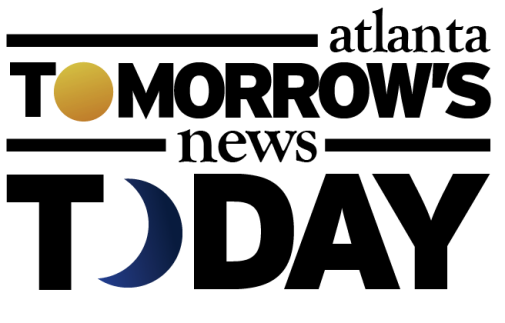 Crew, Gap, and Banana Republic, there are identifying features on the tags of clothing and other related merchandise so that one can readily identify them as being made specifically for the outlet. At Saks Fifth Avenue, however, it is a little more difficult, and may be near impossible to determine the origin of much, if not all, of their outlet merchandise. According to a Saks spokesperson, only 12% of its OFF 5TH merchandise comes from its namesake Saks Fifth Avenue stores. The remaining 88% of the merchandise is sourced directly from vendors and is likely lower quality, less expensive merchandise. There are about about 70 Saks OFF 5TH locations, and only about 40 Saks Fifth Avenue locations, making it difficult to supply the outlet stores with enough full line merchandise on a regular basis, hence the need for other, (lower quality) merchandise. 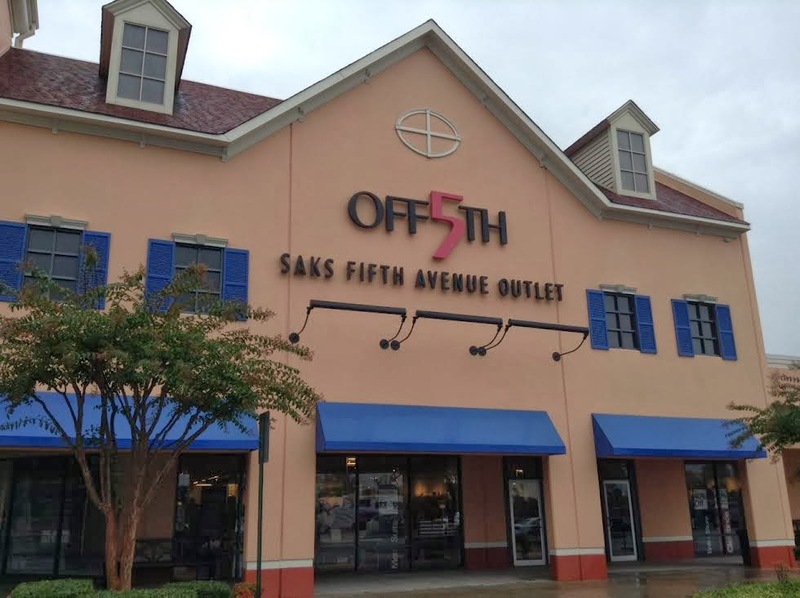 In Georgia, there are three OFF 5TH stores but only one full line Saks Fifth Avenue. Even if you do find merchandise that may have originated in a full line Saks, you may not be getting a deal. I recently visited their store at Sugarloaf Mills in Lawrenceville, and all but swore to myself I would not ever return. In my opinion, there are no "deals," and nearly 90% of what I looked at, I could tell was purchased especially for the outlet. A short time later, I accompanied a friend to North Georgia and was convinced to step into Saks OFF 5TH. As I approached the exit, having found nothing worthwhile, a small bowl caught my eye. The bowl was glass, came in a green box, made by Lenox for Kate Spade. The bowl was about 6 inches in diameter, and had etched dandelions around much of the outside. 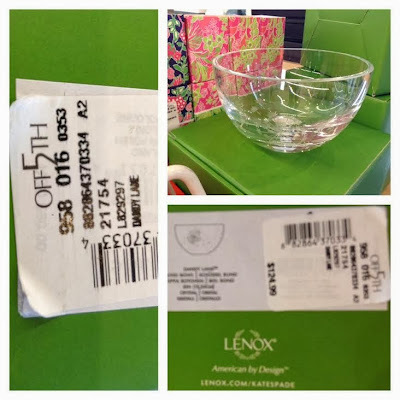 I had seen this bowl before, months ago, at T.J. Maxx and Marshalls stores around Atlanta. I recalled the price for the bowl at T.J. Maxx and Marshalls being $25, on clearance from $40, with a "compare at" price of $60. I picked up the bowl from the table at Saks and saw it priced at $124.99. 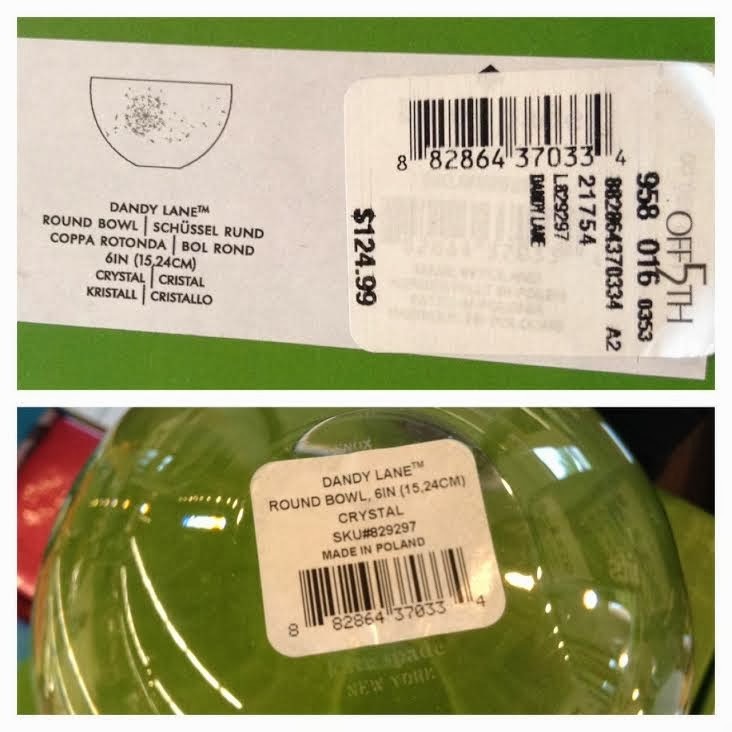 Shocked, I picked up the other two like bowls and each reflected the same "original" price. I was sure this was the same bowl I had seen previously at T. J. Maxx and Marshalls, sure enough, it was. I peeled back the Saks "outlet" sticker that was covering the original Lenox / Kate Spade price sticker and revealed the original manufacturer's price of $60. Today the bowl can be found in many places online and in store. This is a link to the exact bowl for sale on Bed Bath & Beyond's website for $29.99, on sale from $59.99. Another, slightly larger bowl, originally priced by Lenox at $125, was "outlet" priced at $139.99. I was so angry at this manipulation and deception, I could do nothing but walk out. I later called the store and spoke to Andy, who identified himself as the store manager. He suggested the prices may have been "transversed." Of course not all outlets participate in such shady and fraudulent shenanigans. To their credit, Tommy Bahama, notably, actually uses their outlets to sell unsold, past season, and overstock full-line merchandise. 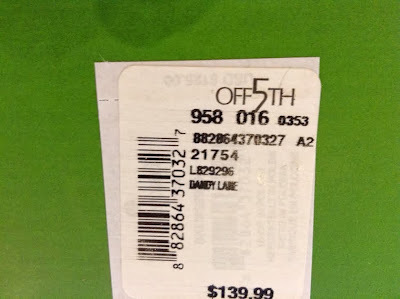 Nordstrom RACK is one of the best department store run outlet stores for actually finding a deal. A friend just scored a pair of Salvatore Ferragamo shoes for 97% off: $10. Neiman-Marcus and Bloomingdale's can each be hit or miss. Bargain shoppers know Nordie Rack is the best! In other news, fast food may cause obesity and illnesses when consumed in excess. this is a funy post. Eli - big deal, I was in Off 5th yesterday and paid less for a dress that I saw at MArshalls as well. Six to one half dozen and most of Nordstrom Rack (about 75%) is not from their stores either. It is bought from the vendors (overstock etc) to sell in thier rack stores like Off 5th. MArshalls and TJ are the same as well!! we landed on the moon??? The only outlets really worth checking out in my book are Cole Haan and Polo. I've definitely seen stuff I've seen in those stores at Nordstrom and Macy's and what not previously. Or if you go to some of the "high-end" outlets in places like Orlando, that's pretty legit too. Everyone else (Gap, Banana, J. Crew, Brooks Brothers), you may as well just wait for a sale at the "real" store. You may even get a better deal there.